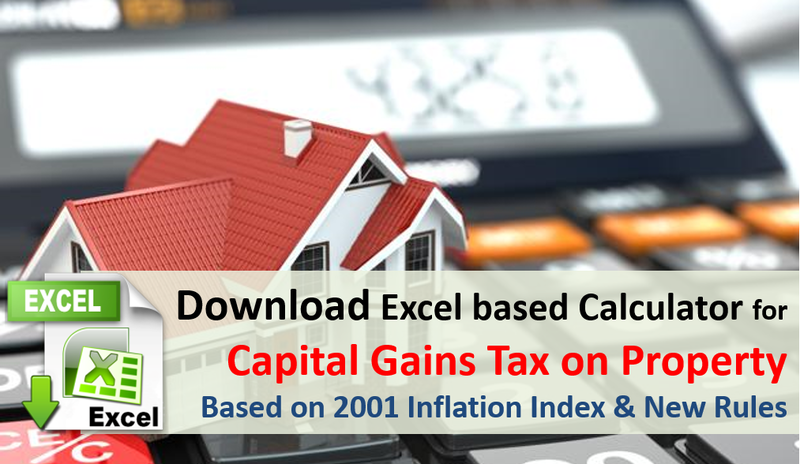 We have compiled an Excel based Capital gains calculator for Property based on new 2001 series CII (Cost Inflation Index). It calculates both Long Term and Short Term capital gains and associated taxes. You need to feed your property sale & purchase date along with values. There is option to include cost of repairs/improvement that you might have incurred during the holding period. If the property is sold after 2 years (changed in Budget 2017 and applicable from April 1, 2017) of purchase the corresponding gains or losses is called LONG Term Capital Gains (or Loss). If sold within 2 years its SHORT Term Capital gains (or loss). Long Term capital gains from property is taxed at flat rate of 20% after taking indexation in account. There is education cess of 3% effectively taking tax to 20.6%. After April 1, 2018 the cess would increase to 4% taking the effective tax to 20.8%. Short Term Capital Gains from property is added to income and taxed at your income tax slab rates. How to Calculate Capital Gains? In case of inherited property you can consider cost related to inheritance paper work. 3. The resultant amount is Capital Gains. For long term capital gains all the deductions are indexed using CII (Cost Inflation Index) published annually by Government of India. 1. In case the property has been purchased before April 2001, you will need to get its fair valuation done by income tax approved valuers as of April 2001. This is because new revised CII for indexation started getting published taking FY 2001-02 as base with value of 100. 2. Cost on improvements made before April 1, 2001 cannot be considered as that should be included in the value of property calculated as of April 1, 2001. 3. To calculated capital gains for inherited property, the purchase cost and time of the original buyer is taken into consideration. There are two ways you can save Long Term Capital Gains from sale of property. Reinvest the amount to buy one new residential property (NO land or commercial property) in India within 2 years of selling or construct a house within 3 years. If you already have bought a house within 1 year before selling the property you get tax exemption. Invest in REC, NHAI, NABARD & PFC Capital Gains Bond up to Rs 50 Lakhs under Section 54EC. The bonds mature in 5 years and offer interest of 5.25% payable annually. The interest received is fully taxable. Also Read: How to Save Long Term Capital Gains Tax from Property? In case you are not able to invest full capital gains as above, you will get tax exemption only on invested amount. The remaining amount would be taxed as per rules. The sale proceeds should be deposited in Capital Gains Account scheme with banks if the gains have not been utilized for buying property or bonds before filing income tax returns. We will do a detailed post on – How to save capital gains on property soon. I had purchased a flat in 2007 for Rs. 698,404/= which I sold in 3rd Aug, 2018 for Rs. 27 lakhs. In the meantime I had booked a new flat in Nov, 2015 for Rs 19 lakhs in instalments in a different town where I want to settle after retirement. The new flat was completed and handed over to me by Sale deed dated 30th Aug, 2018, after I cleared all my dues in Aug, 2018 (Rs. 20,64,361/= including Registration amount) from the amount received after sale of old flat. My question is whether I am eligible to get the benefit of Section 54F in Capital Gains Tax as some are saying I am not eligible as I had booked the new flat more than 1 year before selling the old flat. Kindly clear this doubt. Please inform how to calculate the Capital Gains Tax. I have 3 residential properties. If I sell one of them for long term capital gain can I invest in bonds or house. Is there any restrictions if you own more than one house. Can you please post a artical about ESOPS and Perks. I have booked two bedrooms flat in June 2018.But at present I have 3 nos one bedroom which are older more than 3 years. I am now planning to sale these small flats and reinvest in new one. Please let know whether my capital gain amount can be adjusted with the purchase of new one since I already have more than two flats. My second question is whether repayment of loan amount can be adjusted with the capital gains. For capital gain calculation, should we take the sale amount as mentioned in the sale deed or the amount for which we got the DD from the Bank? Hello Mr Amit, i found this post very useful. My father took money from relative (20 lacs) & purchased 1 flat in my name (Son’s name), after 6 month he sold his old house in 23.5 lacs. I purchase a plot in 15-oct-2015 9 lack and construct a house and also taking loan 7 lack construction loan. now (nov 2018) i am sell the house in 29 lack. And i want to purchase other plot or house. please sir i want to know can i pay the tax? or not if yes how much i pay the tax and my loan amount is deduct my tax payable money? Tax money will cut automatically before payment please sir suggest me i am from dehradun nobody can answer these question here. what is the date of acquisition in case of payments made in installement for e.g. installment paid in the year 2011-12 and 2012-13 and agreement registered in the year 2015-16. Your calculator really helped me. I have a question. There is a section – Cost of Repair 1. For justification to that what type of documents we need to publish to get the exemption? please let me know the list of documents. I have 2 Top up loan documents from the HDFC in different years so can I use those 2 documents for my Cost of Repair. Please update me at the earliest. I had purchased a flat in June 1999for a consideration of Rs.487500 (all inclusive of stamp duty, documentation etc)+ cost of garage Rs.35000.00 . I had incurred expenditure of apprx Rs.30000.00 in May 2007,Rs. 50000.00 in Aug2012 and rs.50000.00 in April 2016 for carrying out major repairs. . Is any evidence of payments required? I sold the property in June 2018 for Rs.2000000.00 what is the capital gain and what will be the tax. As the indices have changed from year 2000-2001 onwards whether indices are to be applied only from 2000-2001 onwards and not for the period prior to year 2000? Can a detailed calculation be forwarded? I have purchased a flat 2.5 years back. I had taken 10 lacs pf loan for that. I had a plot which had purchased 10 years back. Now I’m selling that. Can I take tax benifit to repay the pf loan.